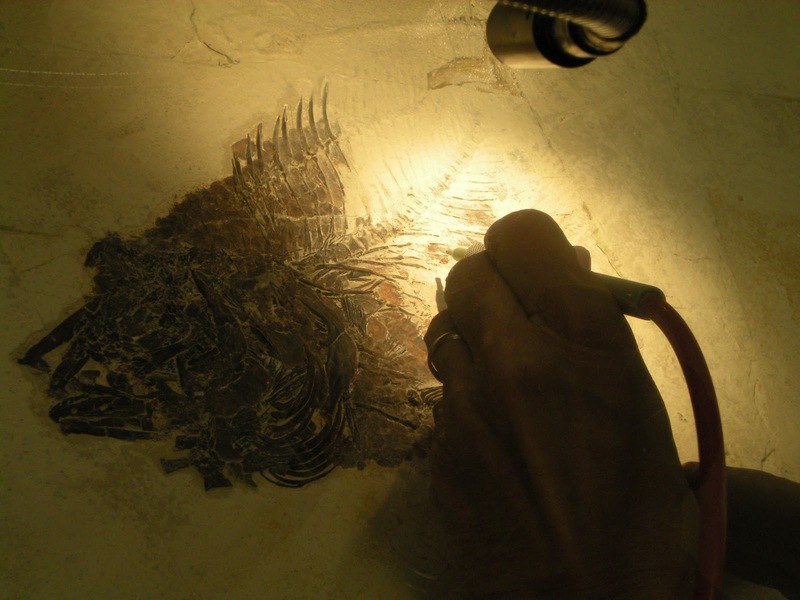 Fossil preparation using a sandblaster. I’m glad to find that we all share a conception of scientific objects as theory-laden, even for objects as different as “bones, blood, and brains”! But I wonder if ontology is the most interesting focus to have here. Does it really matter if a fossil preparator actuallyremoves – or creates, for that matter – what today’s paleontologists interpret as feather traces? That interpretation and the resulting knowledge claims (i.e., that dinosaurs had feathers) are more important, if you ask me. As Lukas wrote, “There is a strong intuition that some such material interventions change the object’s ontology whereas others leave it intact.” Based on my ethnographies of paleontology labs, some changes are considered okay to make to fossils while other changes are not, but these okay and not-okay designations are not universal. Some preparators use super glue to repair fossils, for example, while others are militantly opposed (usually because they only want to make “reversible” changes to specimens, and they deem super glue impossible to fully remove). Fossil preparation, like making blood samples though maybe not like diagnosing a psychiatric patient, is inherently irreversible. You can’t put rock back on once it’s been chiseled off. So this process of making a specimen visible involves quite a lot of decisions with permanent implications, from choosing tools and research goals to seemingly smaller-scale decisions about which scratches in the rock are scratches and which are feathers. It makes sense then that we might want to explain changes in specimen preparation by changes in specimen interpretation. As Lukas wrote and Joanna agreed, “I could easily imagine someone preparing this specimen, trying to free the bones from the rock matrix, inadvertently destroying the fossilized traces of feathers.” I think today’s preparators would agree with you, based on their experience with the difficulty of spotting feather traces and even distinguishing fossil bone from its matrix, in many cases. I might object, however, to blaming the poor unappreciated “invisible technicians” for what was actually an epistemological belief at the time – i.e., that dinosaurs didn’t have feathers, so it wouldn’t have occurred to anyone to look for them, scientist or technician. As Shapin and others point out, invisible technicians are made visible only when problems happen, and then these workers become convenient places to lay the blame. Regardless of who gets the “blame” for the effects of now-rejected past beliefs, I think today’s science technicians are generally very aware of their responsibility for producing reliable specimens (and experiments too). For example, preparators have a community-wide joke about “making foramina”. Foramina are natural holes in bones, such as where blood vessels pass through bone, so this joke centers on the irony of preparators creating holes in fossils with their tools, either by mistake or to please a researcher who may say things like “I want to see foramina in this part of this bone, so that this bone can be identified as belonging to this species…” This joke is common and popular among preparators, but the one time I witnessed researchers hearing the joke, they didn’t laugh. CW: I’ve had two preparators now tell me about Michelangelo’s quote about “The piece is already in the stone”. CW: Have you heard that before? Based on quotes like these and jokes about making foramina, it’s clear that today’s preparators are very aware of the problem Lukas suggests for preparators in the past – of missing information that they may not be looking for and also, crucially, of MAKING information that may not be original to the specimen, either inadvertently or on purpose. So whether these kinds of changes actually occur as a result of the work of data preparators, in any field, is less interesting, in my opinion, than what we believe to be “real” and “natural”, and thus informative about the world. Data – from specimens, patients, experiments, etc. – are only relevant in that they function as foundations for our knowledge claims. Then these objects’ “real”-ness or artifice doesn’t matter unless that status influences how they are used to support knowledge claims. I find how we interpret the world to be more interesting than how the world actually “is”, since that’s impossible to know. What do you think? Should we be studying ontology, or epistemology, or maybe their intersections? Thanks for reading, and keep up the good blogging! This entry was posted in Feathered Dinosaurs, Fossil Preparation, Historical Ontology, Ian Hacking on May 2, 2012 by americanscience. Thanks for the post, Caitlin – you've touched on a lot of the points of contention from our recent Hack-off. One reading of your concluding paragraph is that you hold ontology and epistemology apart from one another–and privilege the latter. As for Kant, so for Caitlin: there *is* a real world but it's inaccessible, so let's talk about interpretation and knowledge instead. What I read Lukas as wanting to do was bring the two together: how we interpret things and what we deem “real” or “natural” have material (he says ontological) consequences that are interesting to study and that in turn feed back into how we interpret things. It's a version of Hacking's “looping,” but one Lukas wants to apply to non-human objects. These aren't *exactly* like “human kinds” – the way non-human objects “interact” with our categories is different from the way human ones do (I think Lukas and Joanna do agree with this) – but it's closer than Hacking wants to allow. Does that “looping” interest you? How do you see epistemology and ontology interacting? And, finally, do *you* think there's an important difference between whether we (historians/scholars) *do* epistemology or ontology (i.e. make claims about knowledge or reality) or *study* the epistemology or ontology (ie the commitments about knowledge or nature) of others? We seem to flip back and forth between these two in this discussion, and I'd love to hear your thoughts. Thanks for your post, “Hank”! I see what you mean about human kinds vs object kinds, and how our beliefs produce material effects, which we then treat as ontology and use to construct our epistemology… it’d be great to know if this type of “looping” usually confirms the original epistemologies – e.g., we didn’t find feathers on dinosaur fossils which means they didn’t have feathers which means we don’t look for or, thus, find feathers – and also how “looping” allows for new interpretations too. The material world is important in constructing our knowledge claims, but this world is always and inevitably interpreted through our lenses of existing belief. Thus I think interpretation reigns supreme over the material world in terms of shaping knowledge, whether interpretation is applied to assessing past beliefs or new material/ontological information. I think it's hard to distinguish between the effects of past beliefs and the effects of interpreting new materials on our knowledge claims, so we as researchers should focus on the process and conclusions of interpretation rather than the input of ontology. I would say – perhaps in a sort of Kantian way – that, since we can’t know the world without interpreting it, our interpretation of the world BECOMES ontology. It may be a “social” reality, but because that’s how we view the world (as well as the only way we can access the world), it must be the most important thing to study. The very interesting question of what WE as scholars are doing – describing the reality of society or our interpretation of it – is a major one in sociology. Sociologists often claim to be “scientific” and objective, such as by using methods like triangulation and statistical analyses to argue that their data are indicators of reality. But sociologists also value being “reflexive”, by acknowledging and even analyzing their own role in shaping data. Perhaps this emphasis on self-reflection and identifying our own biases is a way to bolster the claim that sociological data are objective, rather than an acknowledgement that these data are the more-or-less unique products of specific individual researchers. Despite these claims to ontological truth, I think we as sociologists and historians can only study actors’ epistemology, and only through the lens of our own epistemology too. But actually I think that understanding both actors’ and our own epistemologies is the crucial question about knowledge, rather than how the world may actually work. Do you think that’s too simplified, and that ontology plays a larger role? Or, maybe more importantly, can we as researchers – as observers of both people and nature– access an ontology that we did not first interpret or even create? this is a good discussion, so thanks for contributing to it! I certainly agree with you that objects, like observation, are theory-laden. That's a point that was established a long time ago. But could we not also say that theories are object-laden? One reason many of us have become interested in looking at ontology (which you can often just read as short hand for material culture, instruments, observation, etc.) is that it might represent a way forward. Whereas most of the 20th Century was dominated by epistemology, the 21st might represent a return to ontology. A simplistic view of this more recent trend would be to say that we are simply asserting that despite all the epistemic issues that were discussed from logical positivism onwards to Kuhn and SSK we should abandon some of our skepticism and simply return to a faith in the world's ability to reveal itself to us more or less directly. I don't think any of us would subscribe to such a view. But might there not be some more complex and interesting way to bring our material interaction with the world back into how we understand the process of scientific research to proceed? Some way that does not force us simply to abandon those genuine lessons that were learned from the epistemology-centered philosophy of the 20th century? If so, what might that more sophisticated and interesting view look like? It's this latter question that many of us have been wrestling with.